Ms. Mary Dooley has more than 25 years of experience in residential and commercial lending. She currently operates MPD Mortgage Company, a full-service residential mortgage brokerage company with main operations in Arlington. In addition to serving on the Alliance for Housing Solution Board of Directors, she is currently the Vice President and has served as President for two terms for the Virginia Association of Mortgage Brokers. Mary holds a B.S. in Psychology from the State University of New York and a MBA from Florida Institute of Technology. Mr. José Penaranda brings more than 25 years of real estate experience to the Board. In 1979, he came to the United States from Bolivia and after earning a computer science degree, managed a language school in Washington, D.C. Mr. Peñaranda has been a real estate professional since 1983 and has owned his own brokerage company since 1987. An Arlington resident since 1990, he dedicates many hours of volunteer work at a local homeless shelter. Mr. Erik McLaughlin is a senior Landlord representative with over twenty years of experience. His role is to create and implement effective marketing campaigns and handle all aspects of the lease negotiation process. Mr. Mark Yates Sr. has been a resident of Arlington since 1991 with his wife Christine, and four children. For over 20 years he was a senior principal with a DC based international investment banking firm involving large real estate project development or acquisitions. In 2005, he joined a national private real estate organization directing all phases of development operation for both large residential and commercial projects. Currently Mark is a private developer locally and a principal of New Living 3D Design providing architectural design services locally for residential projects. Mark serves on several committees of the Arlington Chamber of Commerce, and has a B.S. in Public Administration/Managerial Finance from Slippery Rock University of Pennsylvania; various Certifications in Economic Development and Advanced Credit Analysis, and in the past held a Virginia Real Estate License. Ms. Mary Hogan has resided in Arlington for over twenty years. She started and operated a local small retail business for a decade, worked for financial institutions to value distressed properties, and has worked in compliance at a law firm. She is currently a licensed real estate agent, and lives in Arlington with her husband, Michael, and their 2 dogs. Ms. Moore came to Arlington 42 years ago as an intern working for the U. S. Army Research Institute. After completing her graduate work, she opened a consulting business where she designed sales, marketing, and regulatory affairs training for Fortune 100 companies. 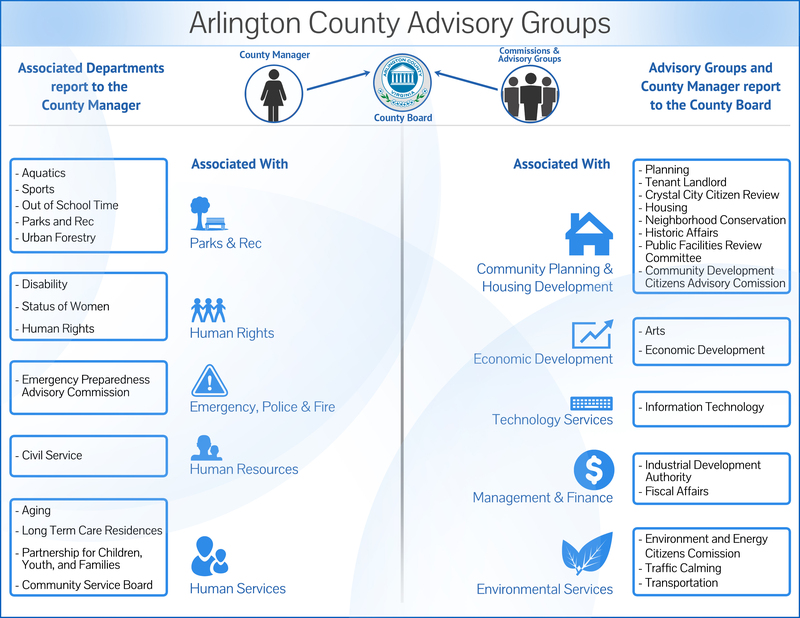 She also has an extensive volunteer history on Arlington school and county commissions and committees—such as the Fiscal Affairs Advisory Commission, the APS Budget Advisory Committee, the Civic Federation’s Planning & Zoning Committee, the Information Technology Advisory Commission, and numerous community organizations. Mr. Barnes Lawson began practicing law in the Commonwealth of Virginia in 1982. The majority of his practice has been directed to the practice of real estate matters. He has handled land use matters, represented businesses in commercial loan closings, examined titles to real estate, drafted contracts to buy and sell real estate, and conducted real estate settlements. For many years, he represented the commercial loan department of First Virginia Bank, conducted settlements for many of their transactions, and prepared loan documents for the Bank. When the law changed in approximately 1993 to require that a bond be posted to conduct real estate settlements, the firm stopped conducting settlements, but continued to represent parties engaged in the buying and selling of real estate and to review settlement documents. Mr. Lawson served on a number of civic type organizations such as ZORC (Zoning Ordinance Review Committee), a sub-committee of the Planning Commission in Arlington, task forces appointed by the Arlington County Board to explore ways to preserve affordable housing and retain small businesses in Arlington. He was appointed by the Fairfax Board of Supervisors to a task force that studied amending the zoning ordinance provisions that regulate houses of worship and the re-planning of the Baileys Crossroads Business Revitalization District. For many years he served on the boards of several corporations that own commercial real estate in the Baileys Crossroads area of Fairfax County. From approximately February of 2009 to June of 2010, he served as a Director of 1st Commonwealth Bank of Virginia and reviewed numerous loan applications. He has served on business advisory boards of several non-profit organizations in Arlington such as the Arlington Arts Center and Arlington Free Clinic. In 2015 he mediated a complex commercial dispute to a successful settlement.